Is it possible to have too much storage? If your answer to that question is no, then you might be interested in the new Fujitsu HandyDrive that packs a whopping 500GB in a package that is ready to go. It’s that time already, where 2.5-inch drives are now available in 500GB capacities and Fujitsu are one of the first to get one out the door. The limiting factor in the past for portable drives was cost and storage amount, and since the cost has now decreased and size has increased, for a home user looking to invest in some kind of backup medium, then a portable drive might be ideal. Why? Because you save space on your desk and you won’t require an extra power socket. 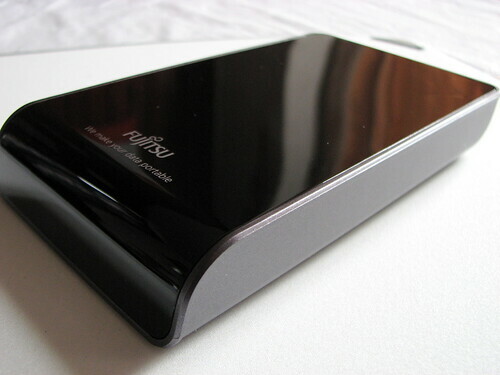 Fujitsu has squeezed in a 4200RPM 500GB 2.5-inch drive in to this sleek enclosure. 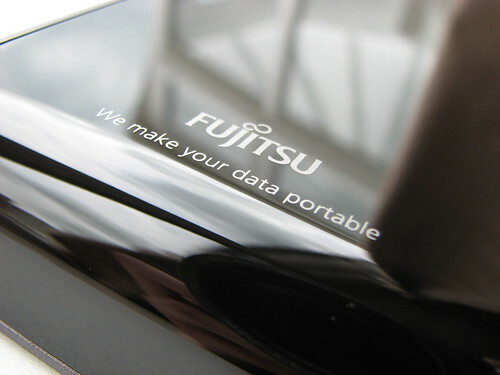 With a glossy black exterior, the Fujitsu HandyDrive is both compact and lightweight. When you pick it up, you wouldn’t think there’s a massive hard disk inside. The physical dimensions of the size make it pocketable, or can easily slip in to a laptop case. 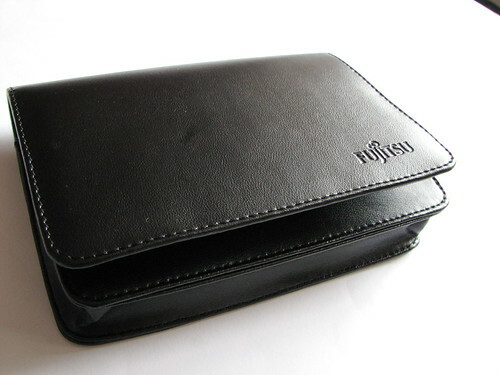 Provided with the drive is a faux leather case to protect the shiny exterior. Hidden just underneath the top surface are the power and activity LED lights which flash green when connected to your computer. At the back, two rubber flaps unfold to reveal the USB and power ports. As with nearly all portable drives, it’s a case of plug and play. 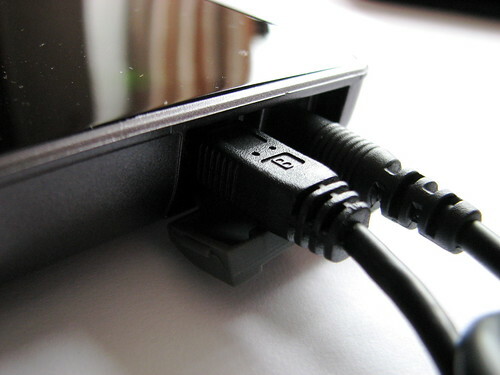 Provided in the box is a set of cables for USB 2.0 connectivity and the drive is pre-formatted to FAT32 for multi-platform compatibility. For machines that don’t output enough power to the USB port, you’ll have to use the second cable that comes with it. This makes it a bit of a nuisance for laptop owners, but unfortunately it’s a universal issue that other drives I’ve tested can experience. In my performance tests, I timed the transfer of a single 700MB file and 361 files totalling 1.51GB and compared it with the times against the iomega UltraMax 640GB RAID drive over FireWire 400 and my Western Digital 500GB drive over FireWire 400. Expectedly so, the Fujitsu comes in with the slowest times, but considering that the two drives it was competing against were desktop-class drives spinning at 7200RPM and transferring over FireWire, the Fujitsu drive proves to be a nippy performer. My only gripe with the HandyDrive is the fact that the exterior, as nice as it looks, will most likely get scratched to death for someone like me, who likes to take data with them everywhere they go. Yes, it does come with a carrying case but that will only protect it during transit. So for me, this drive wouldn’t my needs, but for someone who is using this drive mostly at home, or in the office, and won’t have to deal with the ‘outside world’, the Fujitsu HandyDrive is one of the few 500GB portable drives out there.